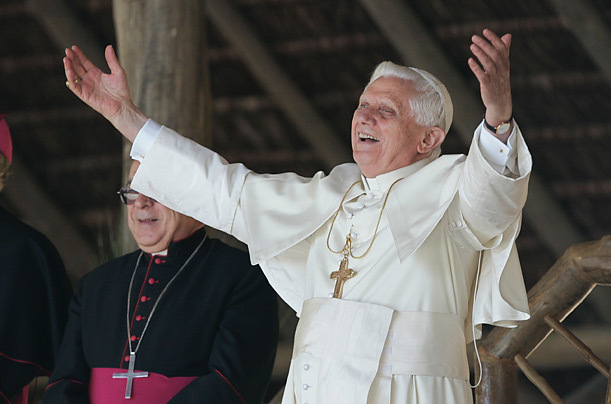 Tomorrow, 12 September, is the tenth anniversary of the brilliant and inspiring discourse pronounced by Pope Benedict XVI at the Collège des Bernardins in Paris. For the children of Saint Benedict, both in the cloister and in the world, this discourse constitutes a veritable charter of Christian culture today. For us monks, it is a compelling summons to persevere humbly and resolutely in the love of learning and the desire for God. At Silverstream Priory we will mark the tenth anniversary of this extraordinary text by reading it together and studying it again. I thank you, Your Eminence, for your kind words. We are gathered in a historic place, built by the spiritual sons of Saint Bernard of Clairvaux, and which Your venerable predecessor, the late Cardinal Jean-Marie Lustiger, desired to be a centre of dialogue between Christian Wisdom and the cultural, intellectual, and artistic currents of contemporary society. In particular, I greet the Minister of Culture, who is here representing the Government, together with Mr Giscard d’Estaing and Mr Jacques Chirac. I likewise greet all the Ministers present, the Representatives of UNESCO, the Mayor of Paris, and all other Authorities in attendance. I do not want to forget my colleagues from the French Institute, who are well aware of my regard for them. I thank the Prince of Broglie for his cordial words. We shall see each other again tomorrow morning. I thank the delegates of the French Islamic community for having accepted the invitation to participate in this meeting: I convey to them by best wishes for the holy season of Ramadan already underway. Of course, I extend warm greetings to the entire, multifaceted world of culture, which you, dear guests, so worthily represent. I would like to speak with you this evening of the origins of western theology and the roots of European culture. I began by recalling that the place in which we are gathered is in a certain way emblematic. It is in fact a placed tied to monastic culture, insofar as young monks came to live here in order to learn to understand their vocation more deeply and to be more faithful to their mission. We are in a place that is associated with the culture of monasticism. Does this still have something to say to us today, or are we merely encountering the world of the past? In order to answer this question, we must consider for a moment the nature of Western monasticism itself. What was it about? From the perspective of monasticism’s historical influence, we could say that, amid the great cultural upheaval resulting from migrations of peoples and the emerging new political configurations, the monasteries were the places where the treasures of ancient culture survived, and where at the same time a new culture slowly took shape out of the old. But how did it happen? What motivated men to come together to these places? What did they want? How did they live? First and foremost, it must be frankly admitted straight away that it was not their intention to create a culture nor even to preserve a culture from the past. Their motivation was much more basic. Their goal was: quaerere Deum. Amid the confusion of the times, in which nothing seemed permanent, they wanted to do the essential – to make an effort to find what was perennially valid and lasting, life itself. They were searching for God. They wanted to go from the inessential to the essential, to the only truly important and reliable thing there is. It is sometimes said that they were “eschatologically” oriented. But this is not to be understood in a temporal sense, as if they were looking ahead to the end of the world or to their own death, but in an existential sense: they were seeking the definitive behind the provisional. Quaerere Deum: because they were Christians, this was not an expedition into a trackless wilderness, a search leading them into total darkness. God himself had provided signposts, indeed he had marked out a path which was theirs to find and to follow. This path was his word, which had been disclosed to men in the books of the sacred Scriptures. Thus, by inner necessity, the search for God demands a culture of the word or – as Jean Leclercq put it: eschatology and grammar are intimately connected with one another in Western monasticism (cf. L’amour des lettres et le désir de Dieu). The longing for God, the désir de Dieu, includes amour des lettres, love of the word, exploration of all its dimensions. Because in the biblical word God comes towards us and we towards him, we must learn to penetrate the secret of language, to understand it in its construction and in the manner of its expression. Thus it is through the search for God that the secular sciences take on their importance, sciences which show us the path towards language. Because the search for God required the culture of the word, it was appropriate that the monastery should have a library, pointing out pathways to the word. It was also appropriate to have a school, in which these pathways could be opened up. 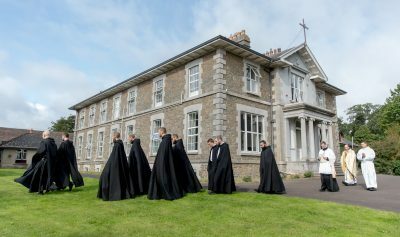 Benedict calls the monastery a dominici servitii schola. The monastery serves eruditio, the formation and education of man – a formation whose ultimate aim is that man should learn how to serve God. But it also includes the formation of reason – education – through which man learns to perceive, in the midst of words, the Word itself. Yet in order to have a full vision of the culture of the word, which essentially pertains to the search for God, we must take a further step. The Word which opens the path of that search, and is to be identified with this path, is a shared word. True, it pierces every individual to the heart (cf. Acts 2:37). Gregory the Great describes this a sharp stabbing pain, which tears open our sleeping soul and awakens us, making us attentive to the essential reality, to God (cf. Leclercq, p. 35). But in the process, it also makes us attentive to one another. The word does not lead to a purely individual path of mystical immersion, but to the pilgrim fellowship of faith. And so this word must not only be pondered, but also correctly read. As in the rabbinic schools, so too with the monks, reading by the individual is at the same time a corporate activity. “But if legere and lectio are used without an explanatory note, then they designate for the most part an activity which, like singing and writing, engages the whole body and the whole spirit”, says Jean Leclercq on the subject (ibid., 21). And once again, a further step is needed. We ourselves are brought into conversation with God by the word of God. The God who speaks in the Bible teaches us how to speak with him ourselves. Particularly in the book of Psalms, he gives us the words with which we can address him, with which we can bring our life, with all its highpoints and lowpoints, into conversation with him, so that life itself thereby becomes a movement towards him. The psalms also contain frequent instructions about how they should be sung and accompanied by instruments. For prayer that issues from the word of God, speech is not enough: music is required. Two chants from the Christian liturgy come from biblical texts in which they are placed on the lips of angels: the Gloria, which is sung by the angels at the birth of Jesus, and the Sanctus, which according to Isaiah 6 is the cry of the seraphim who stand directly before God. Christian worship is therefore an invitation to sing with the angels, and thus to lead the word to its highest destination. Once again, Jean Leclercq says on this subject: “The monks had to find melodies which translate into music the acceptance by redeemed man of the mysteries that he celebrates. The few surviving capitula from Cluny thus show the Christological symbols of the individual modes” (cf. ibid. p. 229). For Benedict, the words of the Psalm: coram angelis psallam Tibi, Domine – in the presence of the angels, I will sing your praise (cf. 138:1) – are the decisive rule governing the prayer and chant of the monks. What this expresses is the awareness that in communal prayer one is singing in the presence of the entire heavenly court, and is thereby measured according to the very highest standards: that one is praying and singing in such a way as to harmonize with the music of the noble spirits who were considered the originators of the harmony of the cosmos, the music of the spheres. From this perspective one can understand the seriousness of a remark by Saint Bernard of Clairvaux, who used an expression from the Platonic tradition handed down by Augustine, to pass judgement on the poor singing of monks, which for him was evidently very far from being a mishap of only minor importance. He describes the confusion resulting from a poorly executed chant as a falling into the “zone of dissimilarity” – the regio dissimilitudinis. Augustine had borrowed this phrase from Platonic philosophy, in order to designate his condition prior to conversion (cf. Confessions, VII, 10.16): man, who is created in God’s likeness, falls in his godforsakenness into the “zone of dissimilarity” – into a remoteness from God, in which he no longer reflects him, and so has become dissimilar not only to God, but to himself, to what being human truly is. Bernard is certainly putting it strongly when he uses this phrase, which indicates man’s falling away from himself, to describe bad singing by monks. But it shows how seriously he viewed the matter. It shows that the culture of singing is also the culture of being, and that the monks have to pray and sing in a manner commensurate with the grandeur of the word handed down to them, with its claim on true beauty. This intrinsic requirement of speaking with God and singing of him with words he himself has given, is what gave rise to the great tradition of Western music. It was not a form of private “creativity”, in which the individual leaves a memorial to himself and makes self-representation his essential criterion. Rather it is about vigilantly recognizing with the “ears of the heart” the inner laws of the music of creation, the archetypes of music that the Creator built into his world and into men, and thus discovering music that is worthy of God, and at the same time truly worthy of man, music whose worthiness resounds in purity. In order to understand to some degree the culture of the word, which developed deep within Western monasticism from the search for God, we need to touch at least briefly on the particular character of the book, or rather books, in which the monks encountered this word. The Bible, considered from a purely historical and literary perspective, is not simply a book, but a collection of literary texts which were redacted over the course of more than a thousand years, and in which the inner unity of the individual books is not immediately apparent. On the contrary, there are visible tensions between them. This is already the case within the Bible of Israel, which we Christians call the Old Testament. It is only rectified when we as Christians link the New Testament writings as, so to speak, a hermeneutical key with the Bible of Israel, and so understand the latter as the journey towards Christ. With good reason, the New Testament generally designates the Bible not as “the Scripture” but as “the Scriptures”, which, when taken together, are naturally then regarded as the one word of God to us. But the use of this plural makes it quite clear that the word of God only comes to us through the human word and through human words, that God only speaks to us through the humanity of human agents, through their words and their history. This means again that the divine element in the word and in the words is not self-evident. To say this in a modern way: the unity of the biblical books and the divine character of their words cannot be grasped by purely historical methods. The historical element is seen in the multiplicity and the humanity. From this perspective one can understand the formulation of a medieval couplet that at first sight appears rather disconcerting: littera gesta docet – quid credas allegoria … (cf. Augustine of Dacia, Rotulus pugillaris, I). The letter indicates the facts; what you have to believe is indicated by allegory, that is to say, by Christological and pneumatological exegesis. We may put it even more simply: Scripture requires exegesis, and it requires the context of the community in which it came to birth and in which it is lived. This is where its unity is to be found, and here too its unifying meaning is opened up. To put it yet another way: there are dimensions of meaning in the word and in words which only come to light within the living community of this history-generating word. Through the growing realization of the different layers of meaning, the word is not devalued, but in fact appears in its full grandeur and dignity. Therefore the Catechism of the Catholic Church can rightly say that Christianity does not simply represent a religion of the book in the classical sense (cf. par. 108). It perceives in the words the Word, the Logos itself, which spreads its mystery through this multiplicity and the reality of a human history. This particular structure of the Bible issues a constantly new challenge to every generation. It excludes by its nature everything that today is known as fundamentalism. In effect, the word of God can never simply be equated with the letter of the text. To attain to it involves a transcending and a process of understanding, led by the inner movement of the whole and hence it also has to become a process of living. Only within the dynamic unity of the whole are the many books one book. The Word of God and his action in the world are revealed only in the word and history of human beings. The whole drama of this topic is illuminated in the writings of Saint Paul. What is meant by the transcending of the letter and understanding it solely from the perspective of the whole, he forcefully expressed as follows: “The letter kills, but the Spirit gives life” (2 Cor 3:6). And he continues: “Where the Spirit is … there is freedom (cf. 2 Cor 3:17). But one can only understand the greatness and breadth of this vision of the biblical word if one listens closely to Paul and then discovers that this liberating Spirit has a name, and hence that freedom has an inner criterion: “The Lord is the Spirit. Where the Spirit is … there is freedom” (2 Cor 3:17). The liberating Spirit is not simply the exegete’s own idea, the exegete’s own vision. The Spirit is Christ, and Christ is the Lord who shows us the way. With the word of Spirit and of freedom, a further horizon opens up, but at the same time a clear limit is placed upon arbitrariness and subjectivity, which unequivocally binds both the individual and the community and brings about a new, higher obligation than that of the letter: namely, the obligation of insight and love. This tension between obligation and freedom, which extends far beyond the literary problem of scriptural exegesis, has also determined the thinking and acting of monasticism and has deeply marked Western culture. This tension presents itself anew as a challenge for our own generation as we face two poles: on the one hand, subjective arbitrariness, and on the other, fundamentalist fanaticism. It would be a disaster if today’s European culture could only conceive freedom as absence of obligation, which would inevitably play into the hands of fanaticism and arbitrariness. Absence of obligation and arbitrariness do not signify freedom, but its destruction. Thus far in our consideration of the “school of God’s service”, as Benedict describes monasticism, we have examined only its orientation towards the word – towards the “ora”. Indeed, this is the starting point that sets the direction for the entire monastic life. But our consideration would remain incomplete if we did not also at least briefly glance at the second component of monasticism, indicated by the “labora”. In the Greek world, manual labour was considered something for slaves. Only the wise man, the one who is truly free, devotes himself to the things of the spirit; he views manual labour as somehow beneath him, and leaves it to people who are not suited to this higher existence in the world of the spirit. The Jewish tradition was quite different: all the great rabbis practised at the same time some form of handcraft. Paul, who as a Rabbi and then as a preacher of the Gospel to the Gentile world was also a tent-maker and earned his living with the work of his own hands, is no exception here, but stands within the common tradition of the rabbinate. Monasticism took up this tradition; manual work is a constitutive element of Christian monasticism. In his Regula, Saint Benedict does not speak specifically about schools, although in practice, he presupposes teaching and learning, as we have seen. However, in one chapter of his Rule, he does speak explicitly about work (cf. Chap. 48). And so does Augustine, who dedicated a book of his own to monastic work. Christians, who thus continued in the tradition previously established by Judaism, must have felt further vindicated by Jesus’s saying in Saint John’s Gospel, in defence of his activity on the Sabbath: “My Father is working still, and I am working” (5:17). The Graeco-Roman world did not have a creator God; according to its vision, the highest divinity could not, as it were, dirty his hands in the business of creating matter. The “making” of the world was the work of the Demiurge, a lower deity. The Christian God is different: he, the one, real and only God, is also the Creator. God is working; he continues working in and on human history. In Christ, he enters personally into the laborious work of history. “My Father is working still, and I am working.” God himself is the Creator of the world, and creation is not yet finished. God works, ergázetai! Thus human work was now seen as a special form of human resemblance to God, as a way in which man can and may share in God’s activity as creator of the world. Monasticism involves not only a culture of the word, but also a culture of work, without which the emergence of Europe, its ethos and its influence on the world would be unthinkable. Naturally, this ethos had to include the idea that human work and shaping of history is understood as sharing in the work of the Creator, and must be evaluated in those terms. Where such evaluation is lacking, where man arrogates to himself the status of god-like creator, his shaping of the world can quickly turn into destruction of the world. We set out from the premise that the basic attitude of monks in the face of the collapse of the old order and its certainties was quaerere Deum – setting out in search of God. We could describe this as the truly philosophical attitude: looking beyond the penultimate, and setting out in search of the ultimate and the true. By becoming a monk, a man set out on a broad and noble path, but he had already found the direction he needed: the word of the Bible, in which he heard God himself speaking. Now he had to try to understand him, so as to be able to approach him. So the monastic journey is indeed a journey into the inner world of the received word, even if an infinite distance is involved. Within the monks’ seeking there is already contained, in some respects, a finding. Therefore, if such seeking is to be possible at all, there has to be an initial spur, which not only arouses the will to seek, but also makes it possible to believe that the way is concealed within this word, or rather: that in this word, God himself has set out towards men, and hence men can come to God through it. To put it another way: there must be proclamation, which speaks to man and so creates conviction, which in turn can become life. If a way is to be opened up into the heart of the biblical word as God’s word, this word must first of all be proclaimed outwardly. The classic formulation of the Christian faith’s intrinsic need to make itself communicable to others, is a phrase from the First Letter of Peter, which in medieval theology was regarded as the biblical basis for the work of theologians: “Always have your answer ready for people who ask you the reason (the logos) for the hope that you all have” (3:15). (The Logos, the reason for hope must become apo-logía; it must become a response). In fact, Christians of the nascent Church did not regard their missionary proclamation as propaganda, designed to enlarge their particular group, but as an inner necessity, consequent upon the nature of their faith: the God in whom they believed was the God of all people, the one, true God, who had revealed himself in the history of Israel and ultimately in his Son, thereby supplying the answer which was of concern to everyone and for which all people, in their innermost hearts, are waiting. The universality of God, and of reason open towards him, is what gave them the motivation—indeed, the obligation—to proclaim the message. They saw their faith as belonging, not to cultural custom that differs from one people to another, but to the domain of truth, which concerns all people equally. The fundamental structure of Christian proclamation “outwards” – towards searching and questioning mankind – is seen in Saint Paul’s address at the Areopagus. We should remember that the Areopagus was not a form of academy at which the most illustrious minds would meet for discussion of lofty matters, but a court of justice, which was competent in matters of religion and ought to have opposed the import of foreign religions. This is exactly what Paul is reproached for: “he seems to be a preacher of foreign divinities” (Acts 17:18). To this, Paul responds: I have found an altar of yours with this inscription: ‘to an unknown god’. What therefore you worship as unknown, this I proclaim to you (17:23). Paul is not proclaiming unknown gods. He is proclaiming him whom men do not know and yet do know – the unknown-known; the one they are seeking, whom ultimately they know already, and who yet remains the unknown and unrecognizable. The deepest layer of human thinking and feeling somehow knows that he must exist, that at the beginning of all things, there must be not irrationality, but creative Reason – not blind chance, but freedom. Yet even though all men somehow know this, as Paul expressly says in the Letter to the Romans (1:21), this knowledge remains unreal: a God who is merely imagined and invented is not God at all. If he does not reveal himself, we cannot gain access to him. The novelty of Christian proclamation is that it can now say to all peoples: he has revealed himself. He personally. And now the way to him is open. The novelty of Christian proclamation does not consist in a thought, but in a deed: God has revealed himself. Yet this is no blind deed, but one which is itself Logos – the presence of eternal reason in our flesh. Verbum caro factum est (Jn 1:14): just so, amid what is made (factum) there is now Logos, Logos is among us. Creation (factum) is rational. Naturally, the humility of reason is always needed, in order to accept it: man’s humility, which responds to God’s humility. Our present situation differs in many respects from the one that Paul encountered in Athens, yet despite the difference, the two situations also have much in common. Our cities are no longer filled with altars and with images of multiple deities. God has truly become for many the great unknown. But just as in the past, when behind the many images of God the question concerning the unknown God was hidden and present, so too the present absence of God is silently besieged by the question concerning him. Quaerere Deum – to seek God and to let oneself be found by him, that is today no less necessary than in former times. A purely positivistic culture which tried to drive the question concerning God into the subjective realm, as being unscientific, would be the capitulation of reason, the renunciation of its highest possibilities, and hence a disaster for humanity, with very grave consequences. What gave Europe’s culture its foundation – the search for God and the readiness to listen to him – remains today the basis of any genuine culture. Thank you.